While you were enjoying grill out with your families on Memorial Day, have you wonder how many families didn’t have anything for dinner??? With God’s Grace held our monthly mobile location in East Dayton at 624 Xenia Ave, Dayton, Ohio 45410. Our families were so grateful for us coming out on Memorial Day to assured our families had food for dinner this evening. 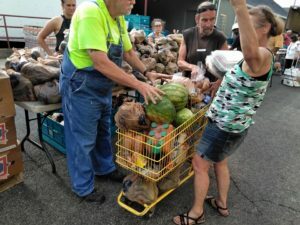 This evening 183 families received watermelons, a bag of Zucchini, 2 heads of cabbage, a bag of eggplant, 3 breads, bakery, a case of juice, 3 cooler and dairy items, 14 non-perishable food items, and dog food for your beloved pets. With God’s Grace would like to thank Foodbank Dayton for opening their doors to allows us to get food to help fight hunger on Memorial Day. With God’s Grace would like to thank our amazing volunteers and Carroll High school for coming out this evening on Memorial Day to make a huge impact in 183 families. We are so thankful for your dedication to helping fight hunger in our community.